Finding great partnerships can be one of the hardest parts of business. Streamline the process with our partnership discovery template. What problem does the potential partner solve for their clients? What are their past successes? What's their reputation? What do we want to achieve with this partnership? What does the other party want to achieve? What is the opportunity for both of our organizations? What value do we provide each other? How do we help each other achieve our respective objectives? How does each party define success? What are the steps required from each of us to accomplish this? What will be the criteria to measure success? What is the timeline for this collaboration? When would each party have to deliver by? What is each party's ideal working relationship? What is the best way to contact each other? Were any key factors identified that could block progress or prevent the partnership from being successful? Do you believe this partnership is viable and should occur? What is the partner's level of interest? What were the main insights from this partnership discovery meeting? Note and share them here. Where to from here? Clarify and list all actionable steps for both parties, who's completing them, and when they should be done by. List all actionable steps here to share. Establishing partnerships is one of the most rewarding aspects of business development. But it's also one of the most difficult; identifying ideal relationships can be tricky. Find the right fit with this adaptable partnership discovery template. Each conversation you have with a prospective partner is critical in learning if you would work well together. Unfortunately, typical templates leave much to be desired. They are often too rigid and isolated. These flaws foster some of the main culprits for collaboration failure: misalignment, lost insights, and lack of actionable plans. Every partnership is different in its advantages and objectives. With this customizable partnership discovery template, you can capture the unique nuances of each possible collaboration. Tailor it to clarify and capture the information you need to understand one another better. You can also say goodbye to information silos. With sharing capabilities, this meeting note template lets you streamline insight distribution for easy continuity. 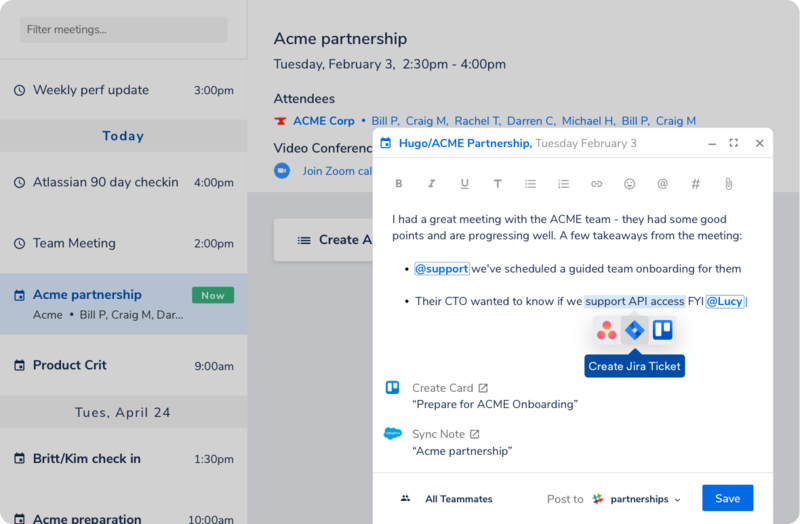 Align your whole team and keep your potential partner on the same page as well. Staying in sync is crucial to any relationship. Make it seamless with this outline. After you've gained a deeper understanding of each other and established trust, it's time for action. And nothing drives that better than accountability. Each party has distinct responsibilities. Ensure positive results by noting them and making each step actionable and assignable directly through this meeting note template. When leveraged properly, this partnership discovery template can help build a better future for both parties involved. Whether your business development team is focused on generating new forms of revenue or accelerating market penetration, hone in on what's important and make it happen with this template. Hugo is a common platform for your team to save and share meeting insights, in real time.